The six officers charged with the death of 25-year-old Baltimore resident Freddie Gray filed a motion demanding that State Attorney Marilyn Mosby recuse herself on Friday evening, citing several conflicts of interest among their reasons. 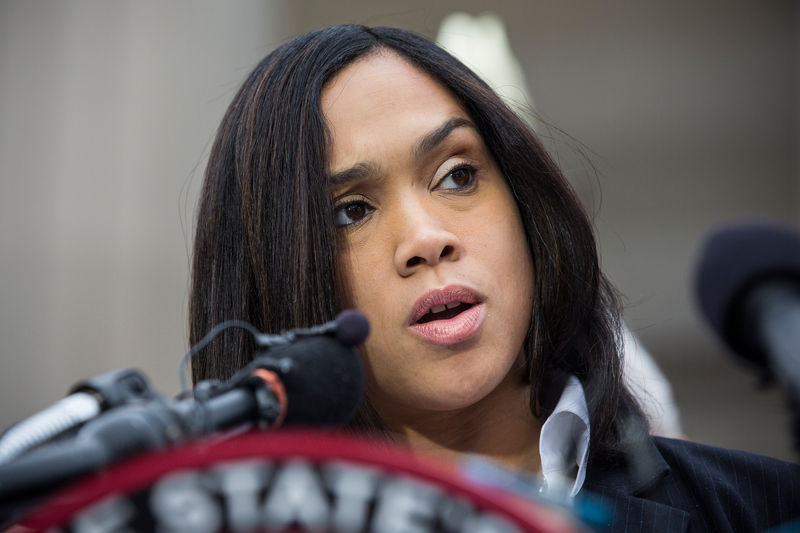 One of the lawyers representing the six officers, attorney Marc L. Zayon, has charged that Mosby's personal connections to the Gray family, as well as the fact that she is married to a city councilman, put her at an impartial disadvantage and hinder her ability to fairly prosecute the officers. The motion also cites the pending civil claim against Mosby's office, reported NBC affiliate WBAL-TV on Friday. "The pleadings speak for themselves and we look forward to litigating them in the courtroom," said Zayon in a comment to WBAL reporters. Bustle has reached out to both parties for comment and is awaiting a response. The six Baltimore officers charged — Officers William G. Porter, Edward M. Nero, Garrett E. Miller, and Caesar R. Goodson, Jr (who drove the police van transporting Gray), along with Sgt. Alicia D. White and Lt. Brian W. Rice — have been accused of varying counts of manslaughter, second degree assault, false imprisonment, and misconduct. If convicted, they face relative sentences of anywhere from 10 to 30 years in prison for their alleged parts in the death of Gray, a black man who was arrested on April 12 and suffered severe injuries while in police custody which left him paralyzed and in the hospital for a week. [The suit] gives five reasons, including the seizing of personal gain by Mosby and her husband, personal relationships with individuals who will be witnesses at trial, the role of her office as the investigators, the pending civil claim against Mosby and her office, and the financial interest of the attorney for the Gray family, who they claim is a close friend of Mosby. I have very deep concerns about the many conflicts of interest presented by your office conducting an investigation in this case. These conflicts include your personal and professional relations with Gray family attorney, William Murphy, and the lead prosecutor's connections with members of the local media. Ryan claimed that because of Mosby's recent television interviews, media members with whom she interacted that could potentially be called as witnesses in the case might have biased viewpoints and might not act truthfully in court. They also alleged that Mosby's husband, Baltimore City Councilman Nick Mosby, stood to benefit from her involvement in the case whether or not she succeeded. The latest motion follows weeks of contentious argument over the legality of a knife found on Gray at the time of his arrest. Investigators initially alleged that the switchblade was not disallowed by city law, leading to false imprisonment charges against the six officers. Baltimore city police later claimed that the knife was, in fact, illegal according to standing laws and asked Mosby to produce the evidence for inspection and confirmation. Mosby has not yet publicly responded to the request. There is no conflict of interest. I'm going to prosecute. I'm the Baltimore state's attorney. My district includes every city in Baltimore city. A number of crimes that take place in Baltimore city and unfortunately in the district we live. Where is the conflict? In the meantime, the heated topic has become a point of concern for several Baltimore officials, one of whom told CNN that they worried for the future of the city's inhabitants if the case were thrown out for any of the defense's allegations against Mosby and her office. Replied one official when questioned about the high tensions in Baltimore, "If this case falls apart, then does Baltimore burn?"